The Centre of Apprenticeship Program (CAP) will form an important part of the TSA Coach Certification Program for the future. The aim of the Program is to assist Candidates in preparation for their TSA Coach Certification Assessments and Career as a TSA Certified Tennis Coach. 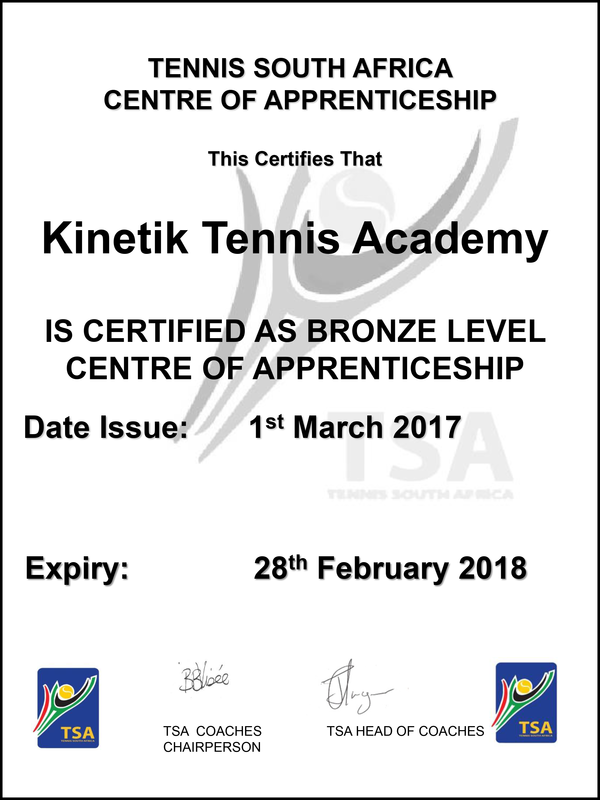 The CAP will provide Candidates with the opportunity to complete these hours and improve as Coaches under TSA Certified Coaches who’s Tennis Schools, Academies, Centres meet the minimum requirements. To provide quality approved Training opportunities for Candidates completing their TSA Coach Certification. To prepare Candidates for their place of work upon completion of their TSA Coach Certification. To assist Candidates in their preparation for Practical Assessments as required for each Level of TSA Coach Certification. To increase the current pass rate of TSA Coach Courses by providing quality Training opportunities to Candidates. We’re thrilled to have the opportunity to provide budding tennis coaches with the opportunity to meet the requirements for their TSA Coach Certification. Being a part of this programme allows us to contribute to growing the pool of talented tennis players and coaches.